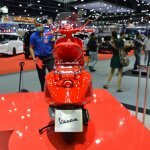 Vespiario Thailand, the authorised distributor of Vespa in Thailand has showcased the Vespa 946 RED and the Vespa Primavera Touring Edition at the 2017 Thai Motor Show. 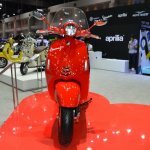 The Vespa 946 RED is a collaborative effort between two partners, Piaggio Group and the Organization (RED). 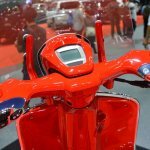 Part of the proceeds from the sale of the scooter will be forwarded to organizations to help people with HIV and prevent mother-to-child transmission. 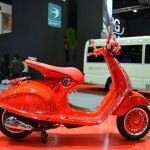 The scooter features a unique Red paint scheme on the bodywork, seat and wheels. Powering the 946 RED is a 155cc single cylinder SOHC engine which mates with a continuously variable transmission. The claimed mileage stands at 59.8 km/l. Suspension bits include a single link arm with coil spring and dual-action hydraulic shock absorber at the front. The rear employs a monoshock with adjustable monoshock. 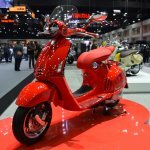 The scooter comes to a halt using 220 mm disc brake on both ends, with ABS. 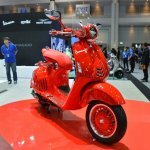 The fuel tank can hold 8.5 litres of juice, and the scooter costs THB 599,000. 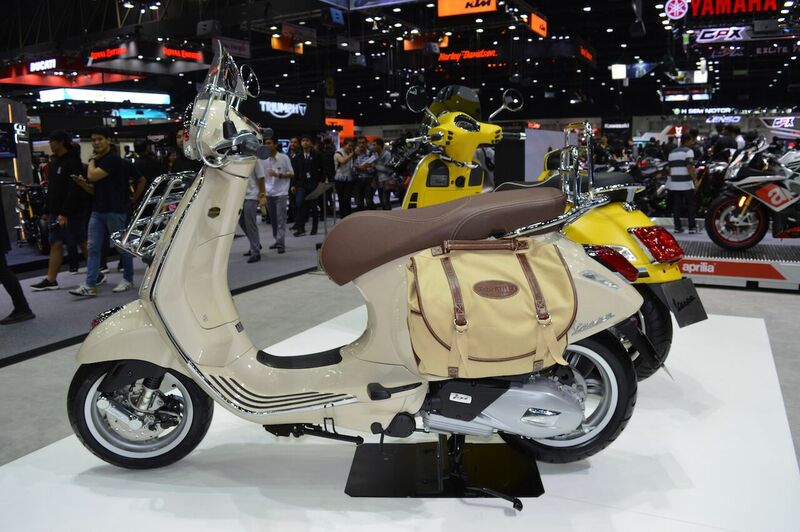 The Vespa Primavera Touring Edition is ideal for munching miles in style. The display scooter features soft saddle bags on the sides, and a tail luggage rack. 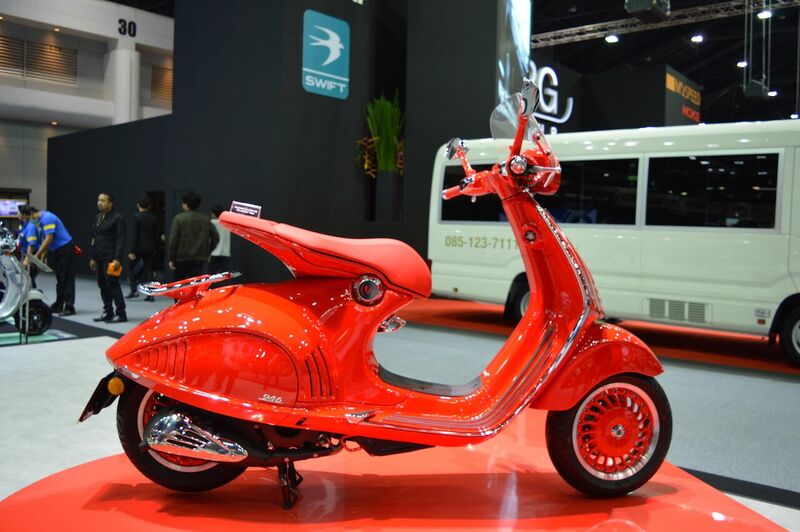 For better comfort and practicality, the scooter also comes with a windscreen, and an apron-mounted luggage rack. 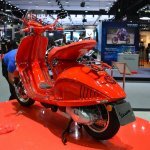 The Primavera Touring Edition gets a 154.8 cc i-Get engine with fuel injection. The mill makes 12.9 PS of power at 7,750 rpm; and 12.8 Nm of torque at 6,500 rpm. The engine works in tandem with a CVT gearbox. 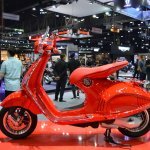 For suspension, the scooter employs single link arm with coil spring at the front; and a rear shock absorber with adjustable preload. Brakes include 200 mm disc at the front and 140 mm rear drum, both ABS. For optimum range, it also has a nine-litre fuel tank. 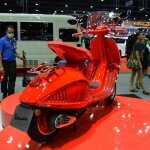 The scooter is priced at THB 134,900.